While hurricane Irene hurled her wrath up the East Coast last weekend, the weather at PHF was beautiful. We attempted to work on some long overdue projects in between making phone calls to check on family members who were caught in her angry grasp. Prayers were answered and we are relieved that they all fared well. On Friday John and Sonny worked on step three of building the smoker. It is beginning to take on shape, even though at this stage it looks more like a hunters blind or a kids play house. You are able to see now how the doors will fit across the front and where the grates will sit at the base of the enclosure. Also on Friday our solar hot water heater and panels were delivered. As of yet we are not sure when we will install it. 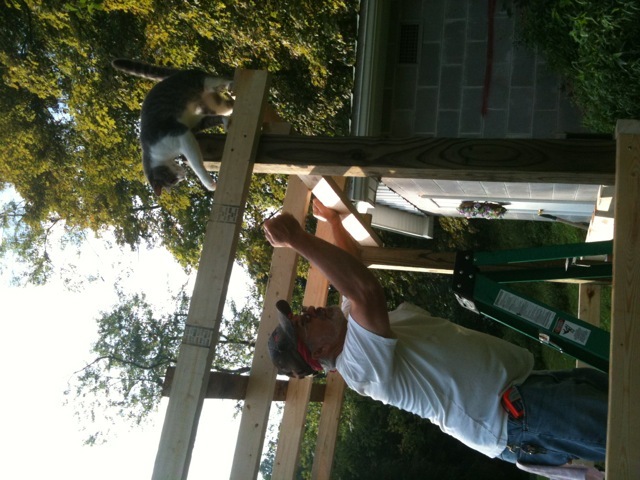 Sonny plans to place the panels on the mudroom roof. At this point I am not sure how it will all work. That is a blog for him to write. The delivery service unloaded everything right there on the driveway. 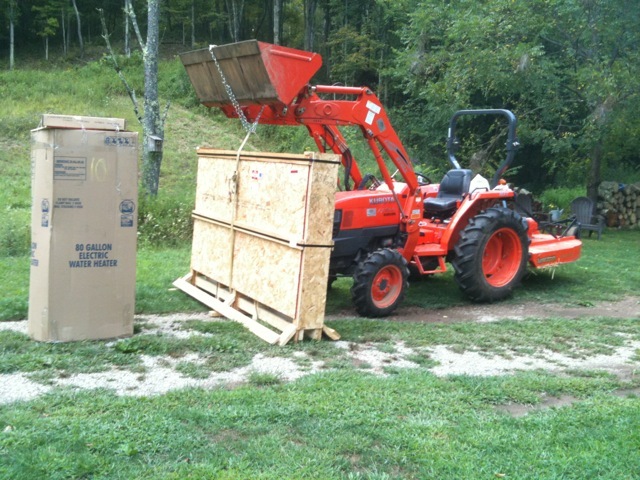 Sonny used the Kubota to move it over near the woodshed. He drove the Kubota and I held onto the box to keep it from banging into the tractor and possibly doing some damage to the panels. They are pretty tough though. It appears the Kubota tractor has come through for us again. I don’t know what we would do without it. It has become such a staple here on PHF. Sonny and Harold have begun to bush hog the pasture that sits on the right side of our property. Its the same area as the infamous tree that got caught in the crook of another. Harold obtained some good experience using the bush hog and I believe is now an expert. They didn’t get it finished, but it is amazing to see how much bigger the pasture is than we had imagined. They still have to remove a few tree logs before finishing. I haven’t complained much on the blog about how the shower Sonny and I installed in the bathroom has been a thorn in my side. All I can say is that it has been a real festering wound for me. Here’s a little advice for all of you that are planning to install a new shower. Do not purchase one that has umptine pieces and parts that have to be sealed together and get one that has a sturdy base. Ours leaked continuously and we were unable to successfully troubleshoot the area that the water was oozing out from. Well our son and his wife came to Mama’s rescue and have offered to help us put in a new one. We have picked a fiberglass style that is much sturdier than what we had put in originally. We wanted one that was all one piece, but had to settle for one that is two pieces so that we can get it through the door. Harold is also going to install Roma Stone flooring like he installed in his house in Texas before they sold it. Thank goodness he has experience. Saturday Sonny and Harold removed the old shower and flooring while Clarissa and I went to pick up feed. They had it completely gutted by the time we returned home. The floor was wet under the vinyl flooring and we finally found where the leak was coming from. It was coming from the area of the drain pipe. Now, this is another reason to get a shower with a sturdy base. I think the shower base we had was flexing when we stood on it allowing water to leak underneath. I have had fans blowing on the floor to dry it out before the men start to work on it this weekend. Sunday and yesterday were down days for me as I had a little intestinal virus. I was able to lay on the couch all day (between bathroom visits) and watch episodes of my current favorite show that Sonny orders from Net Flicks. I figured rest was the best remedy. Today I feel pretty good and have started to can up the bazillion organic carrots that my bargain hunter daughter-in-law brought me. Thats ok this winter we will be glad to have them and I have no doubt in my mind that we will have some jars left for next winter. We have not been successful at growing carrots in our own garden. Must be a sick day for Moby too. Oh wait, I think thats just a lazy kitty. 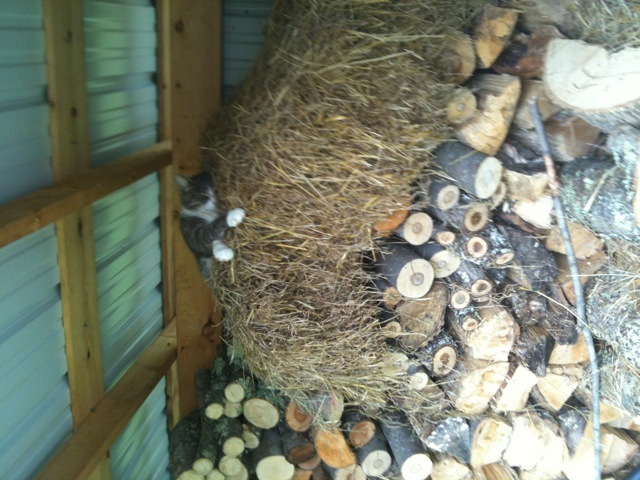 Sunday Sonny was able to go to Two Lynne’s farm and help them put up hay. He got some OJT on running the square baler and fixing it. No, he didn’t break it. It’s pretty common for the strings that tie the bales together to break or become jammed. A lot of these balers are well used but still have a lot life left in them. He enjoyed having a chance to get some baler experience and help our neighbors at the same time. Between my cousin John and Carol and Two Lynne’s Farm we might become decent homesteaders. Hopefully someday we will be able to pass on our experience to someone else. That’s how it works. This coming weekend will be the Labor Day weekend. Here at PHF we will definitely be laboring. So much to do…such little time. Life is good! Twenty-four pints of corn. It is finished. Our friend Gary asked if we would like to come by and pick some of his yellow corn from his garden. His family had picked just about all they needed and he still had a few rows left that needed to be picked before the corn turned too tough. Of course we took him up on his offer. We didn’t plant any corn this year, and it would be great to have some to can up for the winter. John and Carol has kept us supplied with corn on the cob for our dinner table. I believe they grew silver queen which is a white corn and my favorite. The Sunday morning sky looked pretty clear as we left out of the door, but as soon as we got down the road and turned the corner black clouds loomed above us. By the time we got to Gary’s house the sky opened up and dumped buckets of rain. Thunder rolled and lightening cracked. We sat on the porch and talked for a while waiting for the storm to pass. It took an hour or more for the weather to calm and thats when Gary and I with feed in sacks in hand walked to the garden. It only took a few minutes to fill the two feed sacks that I had brought from home. The 50 pound feed sacks that we save from the pig feed come in handy. 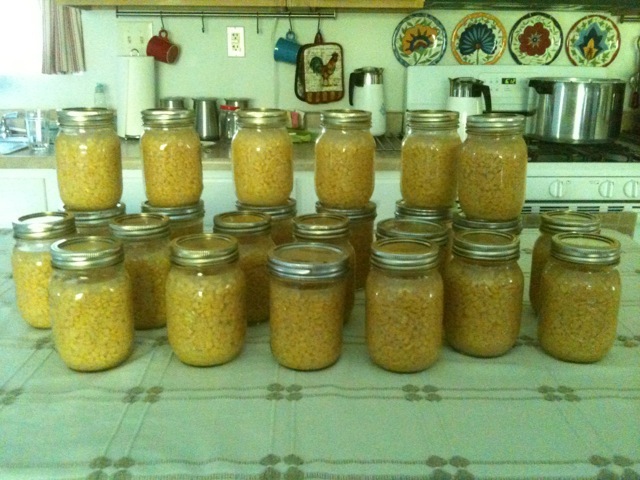 I started canning the corn Sunday afternoon and have been canning ever since. I finished up the last batch today and ended up with 22 pints total. They’ll look nice on the root cellar shelves and taste even better on a cold night this winter. 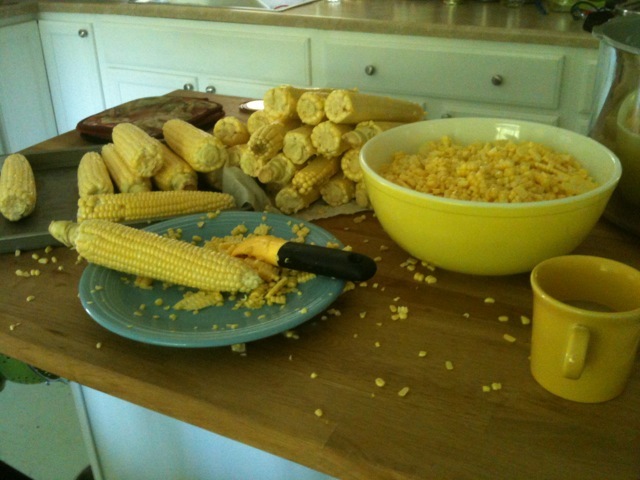 Scraping the corn kernels from the cob. 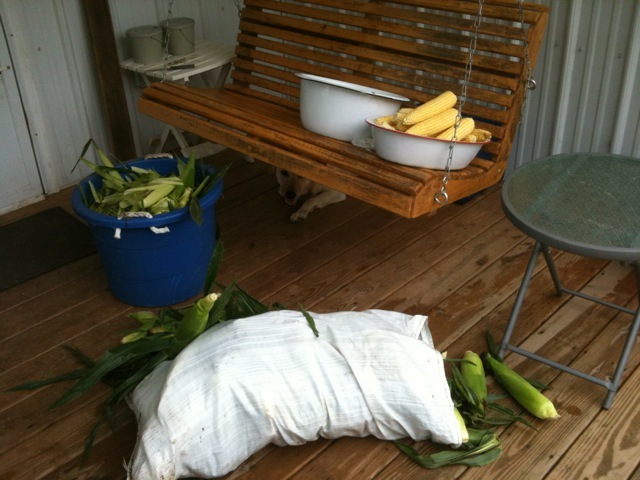 Note: While I was working on the corn today I felt a very slight tremor. The table vibrated and I heard the tinkling sound of glass near the back of the house. I thought to myself that it couldn’t be the washing machine vibrating because it wasn’t running. I thought maybe it was one of the gas companies drilling across the mountain. That just didn’t seem right, it felt too much like the earth quake tremors I had felt before in Japan and Guam. I thought I was crazy until my daughter-in-law called and said an earthquake had hit the east coast near Washington D.C. Guess who was in D.C. today? Yea, my husband. Images of the recent Japan earthquake and tsunamis immediately came to mind when he was there on business and not knowing if he would be able to get out of the country. I was able to worry about Sonny again, not to mention all our family members who live in Delaware. Thankfully everyone was ok. Now we just have to worry about the hurricane headed their way. Anybody have some rope so I can hog tie that man and keep him home? Sonny and I were up until after 11pm on Friday night making cheese. Earlier in the day we had stopped over at Two Lynne’s Farm to get a little ojt on cheese making. They were kind of enough to allow us to borrow the ingredients and utensils needed to make a round of colby cheese. 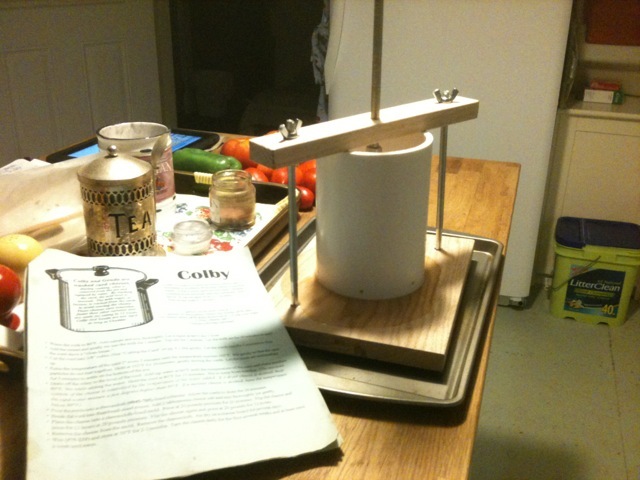 The cheese press Sonny had ordered on line had already arrived in the mail and we were excited to try it out. We started the cheese making process sometime after six in the evening. The key word here is process. There are various steps involved in which the milk must reach and maintain a specific temperature. Once the cheese is placed in the press it is left with twenty pounds of pressure for 12 hours, then it is flipped and pressed for another 12 hours at twenty pounds pressure. 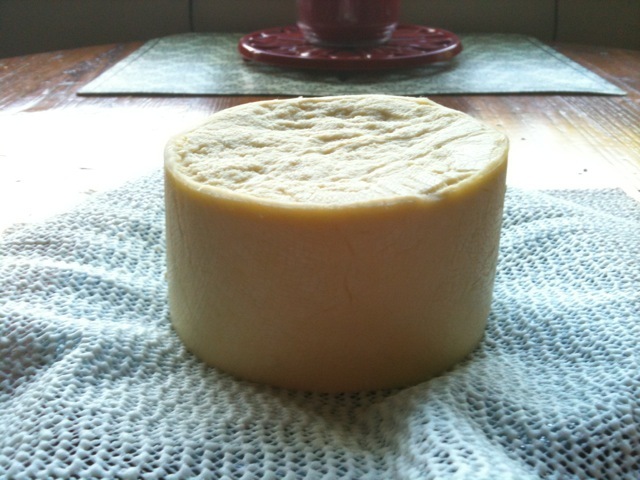 This morning we removed the cheese from the press and it must air dry for several days. After air drying we will then dip it in wax. It will then have to cure for about three to four months being turned every week until it reaches maturity. So in about four months we will let you know how it turned out. Hopefully we did everything right and it has a recognizable taste. Most people know colby as an orange cheese but all cheese is white until a coloring is added. I see no reason to add color and it will taste just the same. Who knows maybe we’ll tackle some cheddar next time. This will be our second winter here at PHF and having gone through a very frigid one already we have figured out that we needed to do a few things differently. One of those things is keeping the propane bottles filled. Its not that it was such a hardship or that we ran out of propane, but it was a bit difficult to load the empty bottles on my cousins truck, drive in to Southern States, come home and unload them again. We had to do this task every few weeks, not to mention that is what we were doing when Sonny slipped off the back of the truck and injured his shoulder. He will have surgery for a torn rotator cuff in about November. He has his doctor’s ok to wait until then so he can finish getting in the winters stock of firewood, as long as he has help. The fact is that neither one of us are as young as we used to be and Sonny will have months of recovery after his surgery. 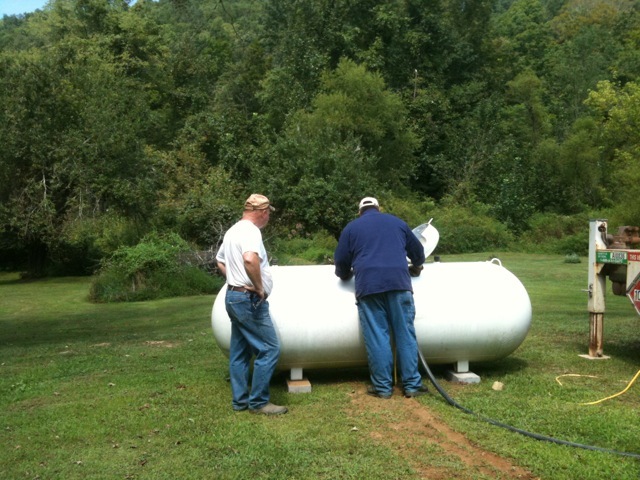 It just made sense to have a 500 gallon propane tank installed and let someone else come out to fill it. Just another of the many lessons we continually learn living off the grid at PHF. The date for the frat boys to go to the meat market is set for September the eighth. Sonny called the company which is located in the town of Shinnston on Monday and made the arrangements. Its a bittersweet feeling for me. In some ways I feel like they are stuck in the London Tower awaiting execution and on the other hand I know that they have had a good life albeit a short one. This was their purpose in life, to give our families sustenance. It is the way of farm life. You have a relationship with your food whether it be animal or vegetable. Everyday there is an interaction, watering, feeding, protecting and making sure that they are happy. It humbles you and makes you appreciate where your food comes originates. The grocery store just can’t do that. You never knew the pig that pork chop came from or the cow that provided that steak. Did they have a good life or was it spent in a filthy feed lot? I am sure they will have a quick demise and I have no doubt that they will be in piggy heaven within minutes. That may sound ridiculous, but if God allows the likes of us humans in heaven then surely there is a special place for animals. He knows every sparrow that falls. I doubt that I will have any problem eating the meat. In my mind I can smell those hams curing in the smoker right now. Mmmmm. Thanks to the frat boys we will be living high on the hog this winter. Thanks frat boys, we’ll raise a glass to ya and sing your praises. Salute! 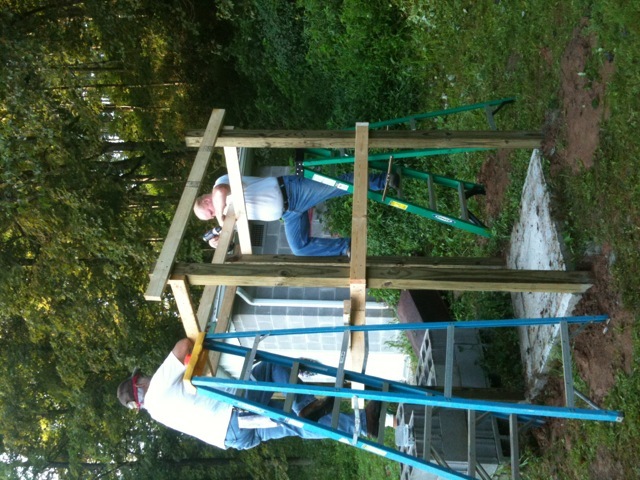 John and Sonny spent Saturday and Sunday morning working on the meat smoker project. They have gotten a good portion of it completed and honestly I don’t know exactly how it will look when finished. They have the design all planned out and I will attempt to explain it. Basically the chamber where the meat will be smoked will be located on the upper portion. 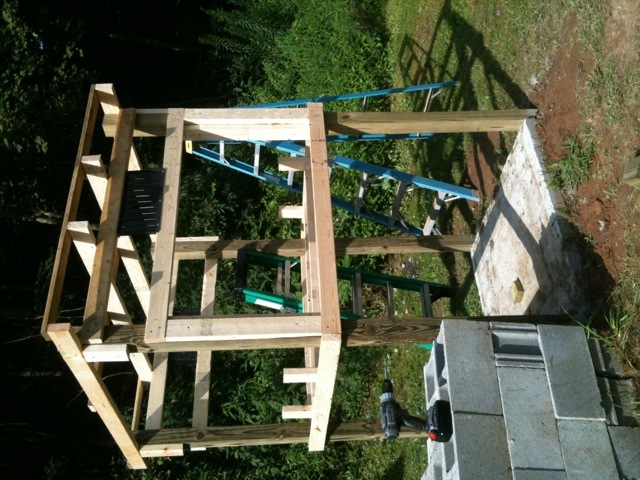 A wood stove will be underneath with a pipe that goes up into the meat smoker chamber. The chamber will made of metal and there will be a door on the front for access to the meat. There will be hooks to hang the meat as well as a grate system for other meat cuts to lay upon. Sonny and John also have a plan for drafts and such. Here are a few of the pics and hopefully you will get an idea of how it will work. Top portion is the smoke chamber. 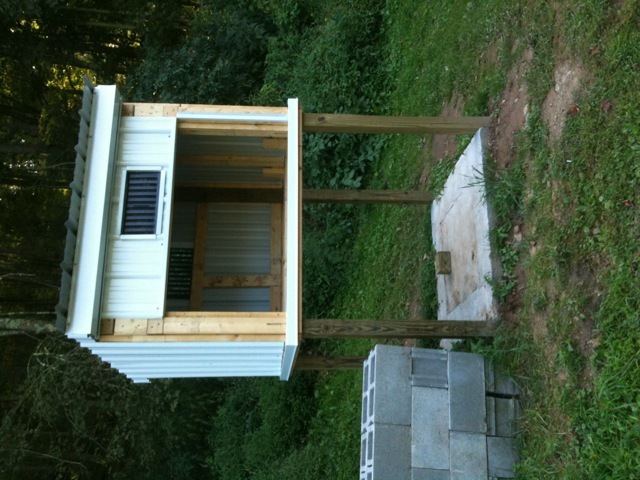 The wood stove will sit on the concrete pad below and will be enclosed when not in use. There is a vent there between the roof and the smoke chamber that can be opened or closed to control the draft. The door will be located in the large opening under the draft vent. Metal rods will be laid across the base of the smoke chamber and then removable grates will be laid on top of them. An exhaust pipe will go up through the roof and I believe there will be one on the right side as well. The upper potion will be enclosed in metal. Hope I have explained this well enough to give you an image of the finished product. Sonny screwing on boards under John's supervision. Inspector Moby has arrived. "This board needs another screw here John." "Hand that vent up here Sonny." 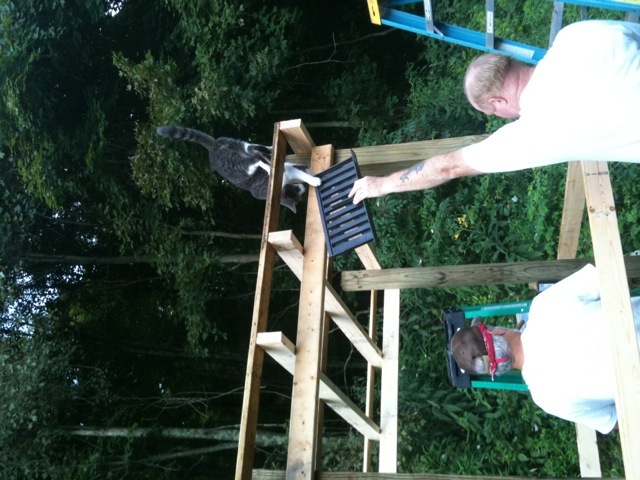 You are currently browsing the Off-Grid in West Virginia blog archives for August, 2011.